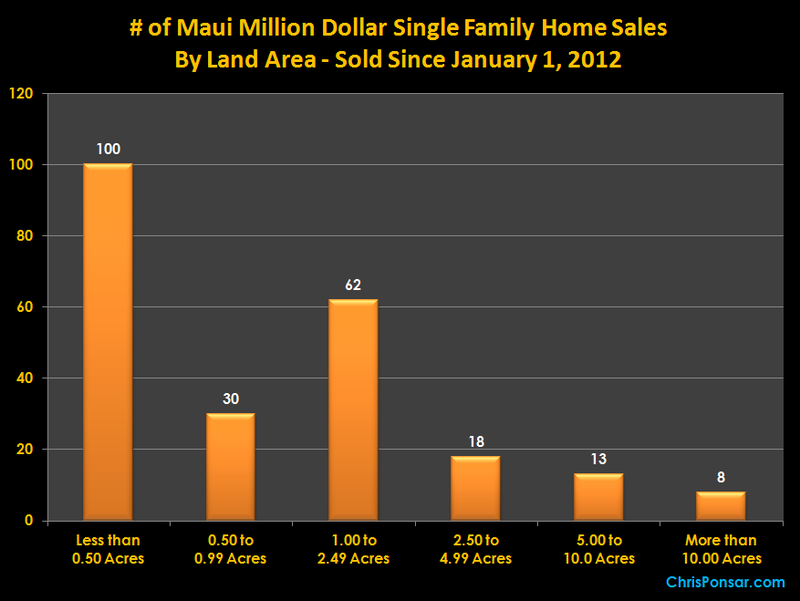 If you are unfamiliar with the luxury home market in Hawaii, the data presented on this graph might be counter-intuitive. As shown, most million dollar home sales are on lots that are smaller than half an acre in size, and only a handful of transactions are on tracts larger than ten acres. Not many people would argue that, all things being equal, more land area is usually better. But on Maui and throughout the Hawaii high-end residential sector, an experienced real estate appraiser understands that beach frontage and ocean views are the primary drivers of market value. Since near-ocean properties are typically subdivided into smaller land area configurations, it is easy to see how the most common high-dollar sales have smaller lots.